Record 6 and play 2 channels of HD on one Mac2. Dongle included. 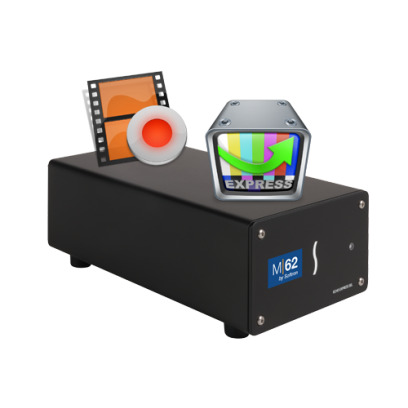 With the M|62, you can enjoy all the amazing features of MovieRecorder and the ones of OnTheAir Video Express in a certified hardware and software bundle. We have gathered what we think are the highest quality hardware components in order to ensure the best experience possible. Just connect theM|62 to your new Mac Pro, using a single Thunderbolt 2 cable, start MovieRecorder 3 and OnTheAir Video Express, and you are ready to start ingesting 6 channels of HD (or SD) and playout 2 channels on your Mac Pro! The M|62 Bundle - All in! A small and silent expansion chassis. Softron has a lot of experience working with Sonnet and their xMac mini Servers and xMac Pro Server solutions. These are amazing products that have been put into service by a number of our users who require rack-mountable solutions. The Sonnet Echo Express SEL is the only Thunderbolt 2 device that is suitable for Low-Profile cards, making it the smallest yet most powerful solution to accommodate the Low-Profile Deltacast card that we chose for the M|62. As you can see in the picture above, you will notice notice that this chassis is very small - just like the new MacPro! AND most importantly, it is QUIET! As usual, the system requirements will depend on the format and codec that you will be using, and we recommend that you run tests to confirm. For 1080i and 720p, encoded in ProRes (Proxy) or ProRes a 6-core Mac Pro will be able to sustain the required CPU power to encode 6 streams and decode 2. For 1080i and 720p, encoded in ProRes (HQ) or ProRes 4444 or DNxHD an 8-core Mac Pro will be able to sustain the required CPU power to encode 6 streams and decode 2.